Page 20 of The Mythic Roots of Western Culture’s Alienation from Nature. Adams and Belasco. Tapestry Institute Occasional Papers, Volume 1, Number 3. July, 2015. Outline / List of Headings available here. Information encoded in Mythic ways of knowing shows that Western culture’s alienation from nature co-arose with the unknown processes that birthed the culture itself. It’s not clear whether the association was coincidental or causal. But the hesitation contemporary people feel to step out on a mountain trail for fear of encountering storms or wild bears, the naïve impulse to throw an arm over a wild buffalo for a snapshot, the pride of mastery in a helicoptered and laser-guided wolf hunt, and Smokey the Bear’s assertion that human beings are solely responsible for destructive forest fires are identifiable motifs that were already present 4000 years ago in the oldest city of “the cradle of Western civilization.” The split of humans from nature, and then of humanus from humana within the psyche alienated from nature, has played out in the Mythic stories and actions of Western culture ever since. Miraculously, so has the voice of the surviving nana moma, disenfranchised and “relegated to the poorest land in the psyche”(97) but clearly identifiable once it’s perceived. The sense of awe and wonder it feels when encountering the natural world punctuates tellings of the Dark Forest, Fiery Desert Myth now the same way it did 4000 years ago when Gilgamesh and Enkidu stood in silence, gazing at the entrance to the forest before they entered it to start a process of deforestation that impacts the region to this day. Enkidu had been created to balance the excesses of humanus in Gilgamesh, but he couldn’t do it. The road had split, the choice been made, long before they reached the overlook. The first cut was in fact the deepest: the severing of humans from nature. Subsequent splitting of humanus from humana was important primarily because it is the humanus’ intense fear that silences the nana moma as an act of perceived self-defense. Figure 8. This diagram shows both splitting events in the psyche of Western culture about 2100 BCE. The two shapes on the right side representing the humanus and humana have been discussed elsewhere. The little stone figure and its markings, on the left side of the diagram, represent the nana moma in ways it is left to the reader to feel out. The heavy vertical black and turquoise line represents the first event of splitting in the psyche of Western culture: the separation of humans from the natural world. The stone figure is from Çatalhöyük, a very large “proto-city” settlement of what is now Turkey. This area, 870 miles northwest or Uruk, was occupied from 7500 to 5700 BCE. It predates the city of Uruk by about the same amount of time that Uruk predates modern times. Images that depict the nana moma or a very similar understanding of the natural world and our relationship with it exist, and have existed, in many cultures around the world. Remember that this view of and relationship with the natural world is present in all human beings and only disappears from cultural expressions when it is actively suppressed. 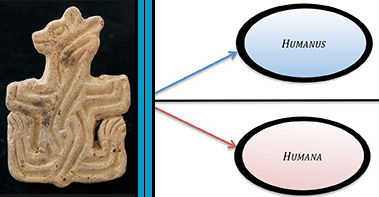 In the previous section of this paper, we used an image from Puebloan and Ute cultures of North America to represent the nana moma, but mythic representations are common in the art of Paleolithic and Neolithic cultures. One of the largest ancient sites that preserves evidence of the whole, pre-split psyche in the Middle East is Çatalhöyük, a proto-city in present-day Turkey, less than 900 miles from the riverbank where Uruk was built about 4000 years later (98). Art and ritual materials at this site demonstrate that the nana moma was initially expressed, not suppressed, in this part of the world. Indigenous peoples inundated by the tidal surge of Western culture have resisted its pressure to separate themselves from nature, though the magnitude and relentlessness of that pressure is staggering and very hard for someone outside those cultures to comprehend. But Vine Deloria explains that Indigenous peoples’ experiences with the natural world simply “proved so intense and so encompassing that Indians did not move away from them.” (100) For this reason, Indigenous cultures are generally places where well-developed and mature forms of the living nana moma still exist. That’s extremely important because the nana moma that has survived deep in Western culture’s unconscious, that is constantly pushed down and silenced by the humanus, requires opportunities for learning if it is to regain an active presence in the conscious mind and develop to maturity. The processes of its maturation are very similar to those by which cognitive abilities such as logic and reason grow and develop in the brain through education and experience. But with respect to development of the nana moma, these normal processes are not possible in Western culture. There are no educational opportunities to explore the nana moma’s perceptions of humans and the rest of the natural world, or to learn how to apply this understanding to personal choice and public policy. Worse, the voice and even the very existence of the nana moma are largely unrecognized by and essentially invisible to most contemporary people. The wholeness nana moma can restore is felt at an intuitive level by many people of the dominant culture, however, and passionately longed for. And if it still resides in the unconscious – if it can do things like fill Robert Frost with such deep yearning to walk into a snowy woods that poetry pours out of his soul – then it would seem that simply letting this voice surface would make everything all right. But this is the temptation that lures a person who’s just gotten the cast off a recently-broken-and-healed leg to play handball without strengthening the atrophied muscles first. It’s essential to realize “. . . we are not saying here that anyone can wander out into the landscape and derive these insights and similar bits of information,” as Vine Deloria warns. “While this information can be transmitted or communicated in many ways, the specificity of it and the requirement of personal involvement eliminate the chance of duplication by anyone through the simple memorization of the mechanics of the phenomenon.” (101; italics Deloria’s) That statement is worth reading several times, slowly and with care. Two things stand in the way of a non-Indigenous person trying to grow and develop the nana moma so it is conscious and fully functional. The first and most subtle obstacle — and therefore the hardest to overcome — is habits of thought and perception that arise from the humanus and humana within the unconscious mind. The second obstacle is finding opportunities to become personally engaged, in meaningful ways, with the natural world and an appropriate teacher or mentor. 95. The Epic of Gilgamesh, Op. cit., Tablet IV. http://www.ancienttexts.org/library/mesopotamian/gilgamesh/tab4.htm. 96. T.H. Watkins, cited in Charles E. Little. 1995. The Dying of the Trees: The Pandemic in America’s Forests. Penguin Books, New York. 275 pages. 98. “Çatalhöyük: Excavations of a Neolithic Anatolian Hoyuk,” official website for excavations and research of Çatalhöyük. Available at http://www.catalhoyuk.com/index.html. Accessed July 30, 2015. Archeological and theological interpretations of art and other objects at this site demonstrate the challenges of understanding a non-Western psyche from a Western cultural perspective. Many reports project researchers’ cultural paradigms onto a people who did not have the relationship to nature or the sacred that researchers assume they must have had. Archeologist Marija Gimbutas used non-Western paradigms of nature and the sacred that persisted in parts of Europe until very recent times, and that were still dominant in the time and place she herself grew up, to interpret Çatalhöyük very differently from they way most of her colleagues did and still do. Gimbutas specifically linked the nana moma to the feminine principle, as has Jungian psychologist and storyteller Clarissa Pinkola Estes. See note 81 on page 18 for additional discussion. 99. Clarissa Pinkola Estes, Op. cit. page 1. 100. Vine Deloria, Jr. 1999. Spirit & Reason: The Vine Deloria, Jr., Reader. Edited by Barbara Deloria, Kristin Foehner, and Sam Scinta. Fulcrum Publishing Co., Golden, CO. page 229. 101. Ibid, page 71. Italics are in the original publication.